Double-cutaway guitars feature maple and mahogany bodies, push-pull "dry switch." Yamaha has announced five new additions to its Revstar Series. 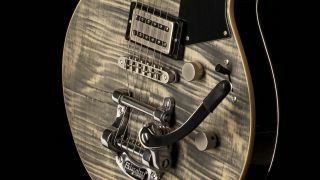 The new models all feature maple and mahogany bodies, three-piece mahogany necks and Yamaha's push-pull "dry switch," which makes it possible to pull single-coil tone from a humbucking pickup. From the company: Designed to race from coffee shop to coffee shop on the streets of London in the 1960s, Café Racer bikes were high-performance racers stripped down to their bare essentials, but still reflected the style of their owner. The RS820 captures that spirit of total focus on performance and cannot be fully appreciated until it is taken out for a test drive. Features include: Hand-brushed satin (steel wool) finish; humbucking pickups/Alnico V; aluminum pickguard; TonePros AVT-II bridge. The style, feel and sound of the RS702B are unmistakably classic, but no detail was simply left to tradition. Its custom-voiced pickups, Bigsby vibrato, inlays inspired by our 1970s "Super Fighter" series and elegant gloss finish combine timeless inspiration with modern prestige. Features include: P-90 single-coil pickups/Alnico V; Bigsby B50. he style, feel and sound of the RS720BX are unmistakably classic, but no detail was simply left to tradition. Its custom-voiced pickups, Bigsby vibrato, inlays inspired by our 1970s "Super Fighter" series and elegant gloss finish combine timeless inspiration with modern prestige. Features include: Humbucking pickups/Alnico V; Bigsby B50. The RS502TFMX represents the purest expression of the Revstar design concept. Balanced perfectly where familiarity and uniqueness coincide, the RS502TFMX is everything you hope it’ll be, with custom-built hardware, the unique Revstar shape, and a tone that inspires. Features include: Flame maple laminated body; hand-brushed satin (steel wool) finish; P-90 single-coil pickups/Alnico V; original aluminum tailpiece. The RS502TFM represents the purest expression of the Revstar design concept. Balanced perfectly where familiarity and uniqueness coincide, the RS502TFM is everything you hope it’ll be, with custom-built hardware, the unique Revstar shape, and a tone that inspires.